Two founding partners of a technology startup asked me to resolve some of their conflicts. Hal initially convinced me that Dave was an antagonistic bully. Dave then convinced me that Hal was a scheming weasel. Yet when I met them individually, they both seemed quite pleasant. Was either of them right? No, they were both wrong. Hal and Dave fell into the Fundamental Attribution Error trap. The FAE is a cognitive bias, or thinking error, through which we ascribe other peoples’ irritating behavior to their personalities (i.e., ‘he completely took over the meeting because he’s a control freak’). But we attribute our own behavior to the circumstances we are in (‘No one was stepping up so I had to move things along’). In other words, the FAE leads us to think our own motives are clean but our opponent’s motives are dirty. And it gets worse: Once we fall victim to the FAE we tend to see anything the other person does through that negative lens, which reinforces our damaging assumption. This would be amusing if it weren’t so destructive. For instance, Hal thought Dave was trying to take over the firm because Dave called a few large clients when Hal was on vacation. And Dave thought Hal was scheming against him when Hal discussed sensitive topics with staff before their weekly meetings. As I listened to Hal and Dave’s competing accusations, I realized that the source of their friction had little to do with their similarity to weasels or bullies. 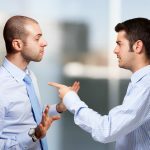 Rather, they were two strong-willed executives who sometimes felt threatened by their partner’s actions. This led them to blame the other for doing something against them. I suggested a process to get at the heart of their rivalry and provide them with tools to manage their differences without me. Our first step was to isolate where friction existed, and where it did not. This helped them see that they were actually aligned in many areas. We then discussed some areas of friction (these were low in frequency but high in impact) and how they usually handled them. For example, their current standard was whoever took the first call cultivated a new client and got extra credit for the sale. This caused conflict and confusion. I said that until they clarified their procedures and decision domains they would continue to ‘box each other out.’ So we assigned either Hal or Dave as primary lead in key areas based on their strengths and interests, but to include their partner in key decisions. I asked them to practice this for a month to see how it felt. When we got back together, I was encouraged that they had asked each other for input through the month even if they were lead in a particular area. And they figured out an equitable process for handling incoming calls. This made me confident to dig a little deeper into their Fundamental Attribution Errors. I asked them each to tell a ‘conflict story’ about when they were upset by their partner’s behavior. I asked them to focus on what happened, and to explain why their partner acted in such a fashion. It soon became clear that their stories ascribed a negative motive to the other person. Each story’s theme included an underlying fear of losing control because their partner was ‘taking over.’ I had to repeat, “You know, its only a story you are telling yourself, it isn’t really true,” several times before they internalized the concept. We all laughed when they realized how much they had in common – it was only when their feelings of control were threatened that they became upset. I asked them over the next month to practice sharing their stories when they became miffed by the other person’s behavior, and to explore different narratives of the same event. At our next meeting Hal and Dave were more relaxed. I told them it was a bit early to declare victory, and asked them to replay some of their recent experiences. I assessed through their stories that both Hal and Dave were using flabby, judgmental language to describe their partner’s behavior. So I taught them a simple feedback tool that helps distinguish observation from judgment, and we built their feedback ‘muscle’ using their stories as a practice field. They loved this tool and agreed to practice in real time. After one more meeting, I ‘fired’ myself from this project, confident that Hal and Dave had integrated their new skills into their daily lives. Hal and Dave are like most of us – good people who don’t want to hurt anyone intentionally but act with little self-awareness when something we value is threatened. But once we identify the underlying friction points we can engage in meaningful dialogue that reveals our misapprehensions. Perhaps even more important, we can then recognize that the conflict stories we tell ourselves about each other are often inaccurate and not very helpful. Want 7 Minutes of provocative leadership insight every month? Subscribe here to our free Leadership Blog.